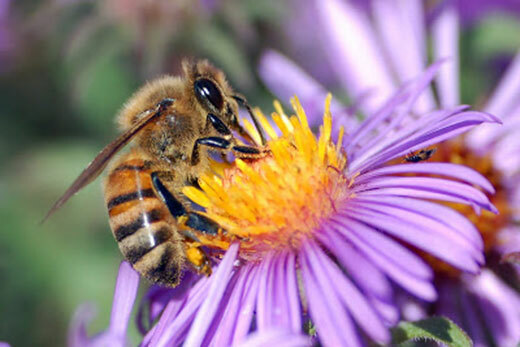 A European honey bee collects nectar, gathering pollen on its body in the process. Emory biologists Karen Bell and Berry Brosi, who study pollen to monitor the health of ecosystems, say that pollen analysis also holds potential to help with forensic investigations. Editor's note: Karen Bell is a post-doctoral fellow in the lab of Berry Brosi, an evolutionary biologist in Emory's Department of Environmental Sciences, focused on the study of bees. Kevin Burgess is a biologist at Columbia State University. This article originally ran in The Conversation. Imagine you're a detective working on a murder case. You have a body, but you believe it was moved from another location. Now what? There's one unexpected tool you might use to follow up on this suspicion: forensic palynology. That's the application of palynology – the study of pollen – to crime investigation. But how does pollen have any bearing on forensics? While usually unseen, pollen is essentially ubiquitous in terrestrial habitats, and it is extremely tough. In fact, pollen is so durable that paleontologists can examine fossilized pollen grains in ancient sediments to see what plants grew during prehistoric times. And the “signature” of which pollen grains are present is specific to a particular place (because different plant species occur in different areas) and time (because different plant species flower at different times). All of that makes pollen an ideal biomarker for linking people and objects to particular places and times, a central need in forensic investigations. Despite this potential utility, forensic palynology has been underutilized, because of its reliance on specialized experts to meticulously identify pollen visually under the microscope. But recently researchers developed a new technique for identifying pollen, using genetics. By making identification much easier and faster for large numbers of pollen samples, this development has the potential to transform forensic palynology, allowing us to harness the power of pollen to solve crimes.